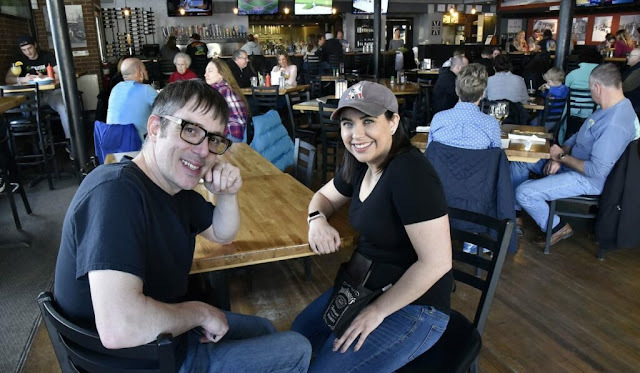 Silver Street Tavern employees Zack Denis and Samantha Clark take a break from serving customers Sunday to talk about the unprecedented $2,000 tip they and other employees will split from an anonymous customer at the Waterville restaurant Saturday. Saturday night started out as a typical evening at the Silver Street Tavern for waitress Samantha Clark. She had just gotten back from a break when her co-worker, Zack Denis, asked her to take over a table of two people, a man and his wife. Denis had just taken their drink and dinner order. Clark, 21, said the couple was friendly and easy to wait on, although a few things went wrong with their table. At one point, the man said someone had taken his wine glass by mistake. The bartender brought him a new glass, and Clark thought the situation was cleared up. But later on, she worried when the man asked if he could talk to the manager. “We thought he was going to complain or that we did something wrong,” she said. But when Clark pressed him for details, she said her manager wouldn’t tell her what the customer said. It wasn’t until later in the evening when one of the bartenders who had gotten off work was sitting at the bar scrolling through Facebook that Clark learned more details of the conversation. The customer, who she had never seen before, had left a $2,000 tip on his $48 check and instructed the manager to split it among the staff. Someone from the restaurant had posted about the generous tip on the restaurant Facebook page, without revealing the name of the diner, who asked to be anonymous. By Sunday afternoon, the restaurant’s post about the tip had garnered almost 1,000 likes and been shared 132 times. Clark said she couldn’t think of a reason why the customers, who she described as “an older gentleman and his wife,” would have left such a generous tip. Clark said the money will be split among the 14 staff members who were working Saturday night, including waitstaff, bar staff and the kitchen. Divided evenly, each person will get about $140. A senior at Thomas College, Clark, of Benton, said she plans to put the extra cash toward her college tuition. Her coworker, Denis, who has worked at the restaurant for three years, said he was equally surprised by the tip. Charlie Giguere, owner of the Silver Street Tavern, echoed those words. Clark said she has never seen a tip of that size in the almost two years she’s worked at the restaurant.